Municipal and industrial engineers will find McCrometer’s FPI Mag (Full Profile Insertion) Electromagnetic Flow Meter features the new M-Series Converter, providing excellent accuracy to ±0.5% of reading and has obtained CSA certification to UL 61010-1 and CSA C22.2 No.61010-1-04, expanding the markets and applications for this meter. Featuring an advanced filtering algorithm, McCrometer’s M-Series Converter supports FPI Mag Flow Meter accuracy of ±0.5% of reading from 1 to 32 ft/s and ±1% from 0.3 to 1 ft/s. The M-Series Converter offers many other new features, including built-in dual 4-20 mA outputs for communication flexibility, additional programmable outputs to support SCADA systems, and a simplified menu structure for ease of use. The FPI Mag installs without service interruption making it ideal for retrofits, upgrades, and maintenance projects and sites never metered before. The hot tap installation reduces installation time by eliminating the need to de-water lines or cut pipe, saving customers up to 45%. 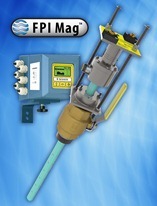 The FPI Mag is available for forward-flow only or a bi-directional measurement for line sizes from 4 to 138 inches. The flow sensor comes pre-calibrated from McCrometer’s NIST traceable Calibration Lab and requires no recalibration in the field. Typical municipal water applications for the FPI Mag include wells, booster stations, effluent, filter balancing and backwash, pumping stations, UV dosing, and potable water distribution. The product also supports applications in a wide range of industrial process plants including chemical, electric power, food/beverage, oil/gas refining, metals/mining, pulp/paper, and more.